Hoe hoe grow: Off with their heads ! 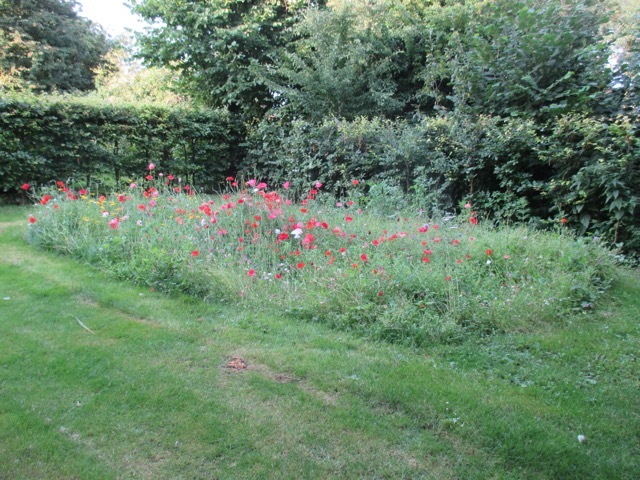 There has been much discussion in our household over the last four years, about the relative merits of the so called 'Pictorial meadow'. Discussion has always been amicable, and our views are not polarised, but we have found it very difficult to make a decision as to whether it is worth all the effort it entails. When our little patch of meadow looks good, we agree that, actually, it earns its place in the garden, and it can stay. And once those flowers lie down they refuse to get up, but choose to languish horizontally until the end of the season. It usually starts in a promising way with lots and lots of densely packed seedlings, which seem to take forever to grow. When they finally begin to flower they look truly fantastic ... but only for a nano second. Even if there are no unauthorised forays into the patch, it quickly begins to flatten and sprawl. For the first two years we grew a taller mix, which was even more prone to collapse than the 'short' mix we grew this year. We really thought we had found the solution with this shorter mix, but it is going the way of its taller cousins. The mix itself is fantastic, and the individual flowers are beautiful and well chosen. 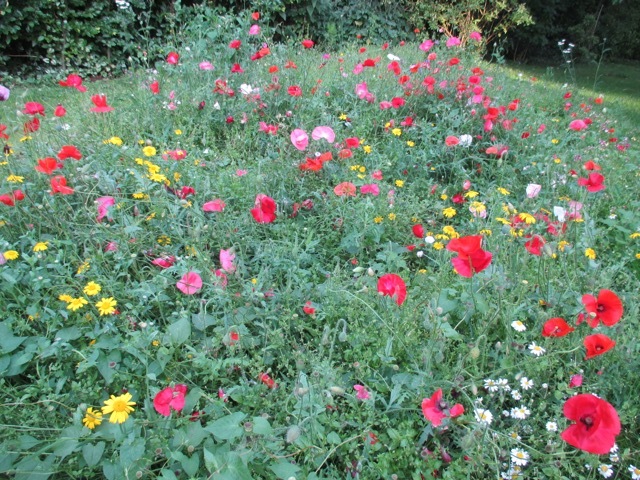 Although people tend to refer to it as a 'wild flower meadow' this is a misnomer, as it is a collection of annuals, some indigenous, which provide colour over a long period. The most prominent in our mix are cornflowers, poppies, Ladies Bedstraw and cosmos. The individual blooms are gorgeous, and I love the silky , dark red poppies. 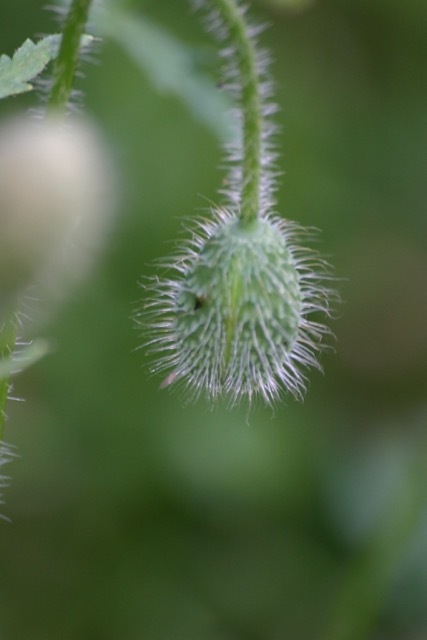 Apart from the droop and sprawl, which seems to be an annual occurrence, we have real problems weeding the patch, and so find that certain weeds take over, and then smother the flowers. 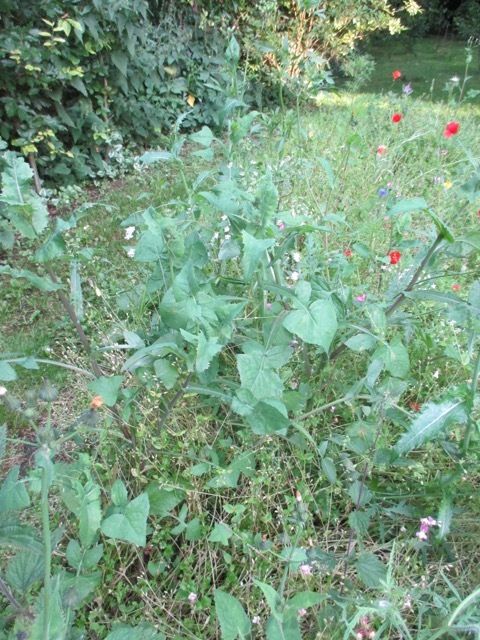 Because the flowers are sown in a dense area to give maximum impact, it is impossible to get access to weed the centre. 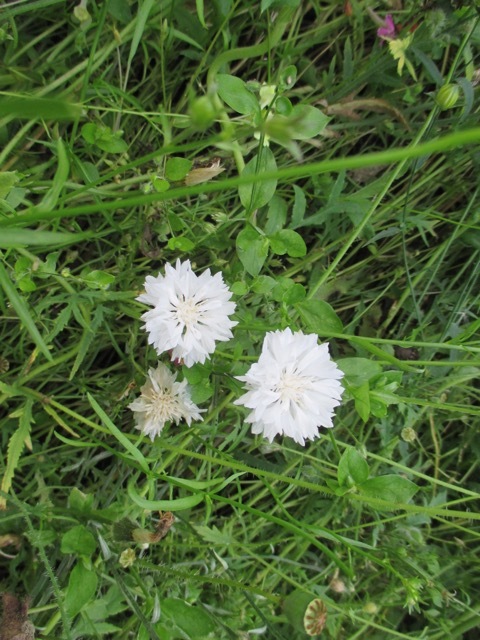 Also, it is hard to identify the weed seedlings from the flowers, so mistakes would be made when the plants are small. Once the weeds have grown large enough to be identified, pulling them out would disturb the smaller plants growing around the weed. To sow even a little patch like ours is relatively expensive, and it is an ongoing annual expense. Yes, there are perennial mixes, but our site is used for bonfires during the rest of the year, so we need it to be totally free of plants then. There is quite a lot of preparation needed before the flower seeds can be sown every year, the site needs to be well weeded and perennial weeds dug out. It then needs hoeing, and fine raking before the seeds can be sown. The seed is expensive, and sown quite densely, so the area needs to be marked out into metre squares, and the seed weighing out before it is scattered, so that germination is even. This would all be worth it if we got months of pleasure from the finished result, but we have been disappointed every year, sooner or later. So , the most indecisive gardeners in the world have finally made a decision to call time on the flower patch, and use the area for something else. We are contemplating building a permanent fire pit with benches, as we do love our bonfires. 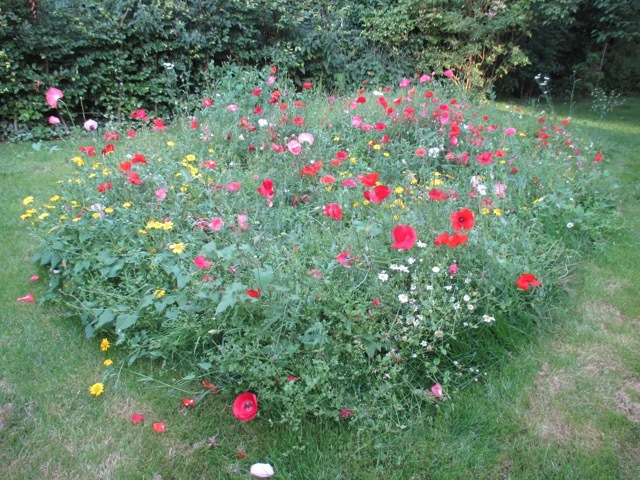 First pictures are really beautiful of your 'wildflower meadow', but I can understand you are fed up with it. A permanent fire pit is not a bad idea, I like bonfires. 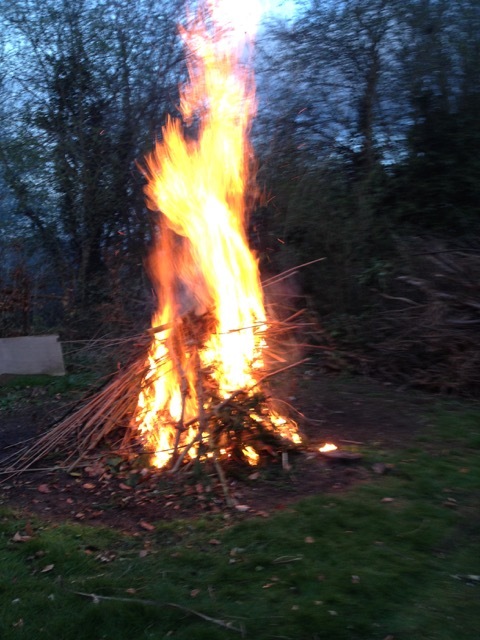 Hi Janneke, you can't beat a good bonfire, even on the coldest of nights! I have not tried one but I can see how they can be hard work. Hi Phillip, I wouldn't mind the work if the end results were worth it, but sadly, it is just not working for us. Sometimes they work, sometimes they don't. Fire pits are fun. There are so many options, and it's always best to go with what works for you. Firepits are so much fun ! I know annual flower patches work extremely well for some people, but not for us! I think you have made the right decision, Jane, as hard as it must have been. 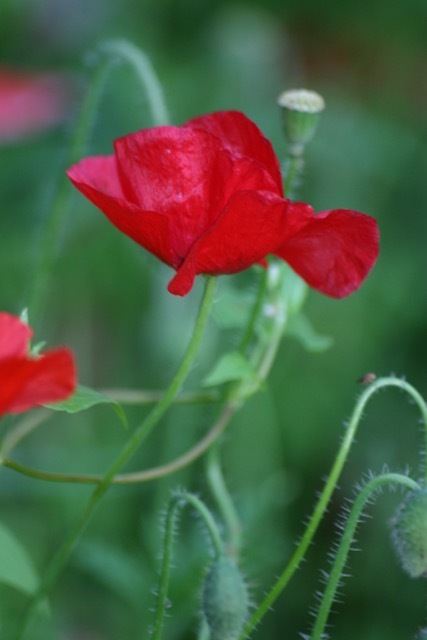 You could still grow the poppies and other annuals you love in your gardens and enjoy them for what they are. If you use this site for bonfires anyway, a fire pit sounds like a great idea. Yes, Lyn, I could still grow a lot of those annuals in a slightly different context which would hopefully be more successful. I have made more than one blunder by falling in love with something during its fifteen minutes of fame, only to find its dreadful side after it was too late. This tale of woe is going a long way toward warning me off my fantasy of a meadow. Hi Ricki, I know what you mean - Prairie planting is something else we have toyed with trying, but I think that may be the same, as it needs to be done on a vast scale to really work. You've done a fine job with the small patch but perhaps a big space really is needed to make it less work funny enough. Love the idea of the fire pit! I think you are right, and that it is elements of scale which are the real problem - the cost of doing it on a large scale, however, would be astronomical ... fire pit it is !! It looks beautiful when at it's best but I can understand your frustration when the flowers flatten and refuse to perk up again. 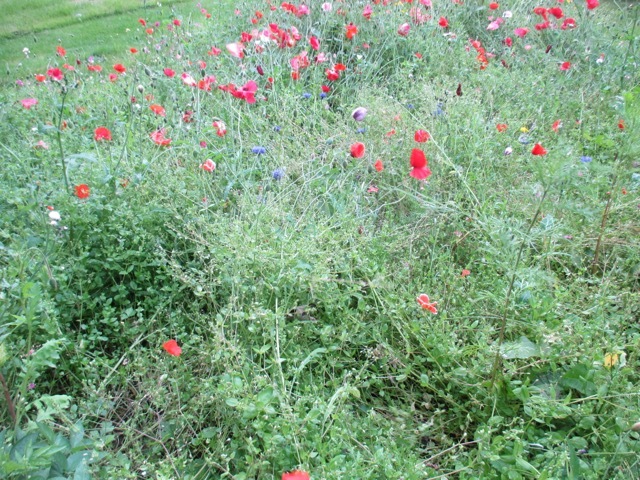 I've included photos of the pictorial meadow at Harlow Carr in my latest post. I'm sure you'll still enjoy the area when you install the fire pit, and it will be useful too. Hi Jo, I will pop across and have a look at those photos ! I bet Harlow Carr don't have problems with horizontal flower stems!! I don't think there is in any doubt that these things work much better in an open aspect Jane, you have only to look at the difference between the middle and the edges of a flower meadow if there are trees involved. In my garden most annual plants, and some perennials to, tend to be drawn due to the shady conditions. It did look good to start with though!! Hi Rick, I am sure you are right. Although the area is not in direct shade from any trees, it is not a truly open aspect, so maybe that has contributed to overstretched plant stems ! With autumn approaching a fire pit with baked jacket potatoes and a glass of something sounds very tempting! What could be better Brian! I understand exactly what you mean as we have a similar area. In our case the pants are perennial - mostly tall yellow daisies (rudbeckia, coreopsis, silfium, perennial sunflowers). Most of the year it does not look like much and even when it is at its best, it could be a lot better. I am thinking about using the space for something completely different. It is good to try things out I guess, even if you end up changing your mind. A few years ago, I propagated 400 festuca grasses to edge a border, then ripped them all out as they just did not work. We would have loved some wild flower areas at the top end of the garden but instead opted (lazily) just to mow paths through the grass and let the rest do whatever. It actually looks quite effective billowing in the wind. We did an interim 'haircut' with shears but other than that, we'll just mow it down by degrees as autumn approaches. The rest of the garden, the remaining two thirds beyond some trellis, is maintained with borders, perennials and a large, neat curvy lawn. I can envisage from your photos just how much work is actually involved with sowing a wild flower area but good for you for at least giving it your best shot. Enjoy the bonfires! 'Lazily' is good, in my book Alison! The line of least resistance can be the best! Bonfires, baked potatoes and a glass (or two) of red win hands down too! This is interesting and salutary especially for anyone drawn to the idea and thinking of doing it. I do wonder if it might have worked better practically and aesthetically if it had been framed in some way? ie if you had had a clear edging, (small hedge/fence or similar) that might have protected it a bit from wind, small boys and balls and being walked on, and the 'frame' would have set it off visually. 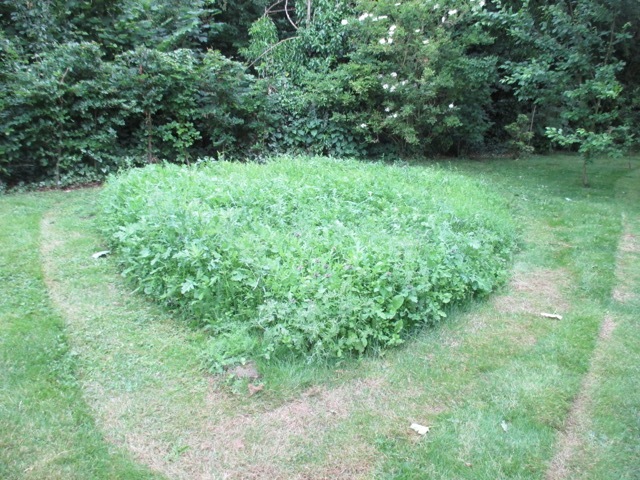 I remember that Derry Watkins (of Special Plants) did a small annual meadow like that and found it deteriorated over two or three years, getting weedier despite her efforts. She gave it up too. Hi Anne and thanks for comments. A frame is an interesting idea but sadly, too late to try out!! I shall visit 'Special Plants' to check out Derry's annual meadow and perhaps to commiserate too!! It's a bit like our annual flower that except ours is smaller and so we can dead head and keep it looking good for longer we also grow through weed control fabric and don't have any grass. The flowers you grow seem to be very similar though. Hi Sue, growing through weed control fabric is certainly a good idea as they have proved such a problem - wish I had longer arms to reach into the centre!! What a beautiful patch, love the colours! Hi Anca and thank you for your comments. The colour is definitely reducing by the day now ! It must take a lot of confidence to take out a patch of vibrant colour and know that another part of the garden can compensate. I guess that is the sign of awell planned garden - something I aspire towards! Hi David - I aspire to that too! I guess it is a case of trial and error with some aspects of the garden. Some things work ... and some just don't! Thank you for that. It does inspire me that your garden is so beautiful. We actually know each other fron john Leggott. Hi David, funnily enough I did wonder if it was you when I saw your name as it so unusual ! How are you ? Are you still in the area ? Clearly a gardener ! I live in Surrey now. The roots with the old town are somewhat tenuous (forgive the pun)!). I am not a very good gardener but I do try hard. I am a real dodo at blogging. I did reply to you but am unsure what gets sent and what not. I live in Surrey. I come to S rarely. that said i am there this w/e seeing my sister and would love to say hello. Hi David, sorry but we are going away this weekend - the last hurrah before school starts again next week ! Hope you have a good time with your sister ! 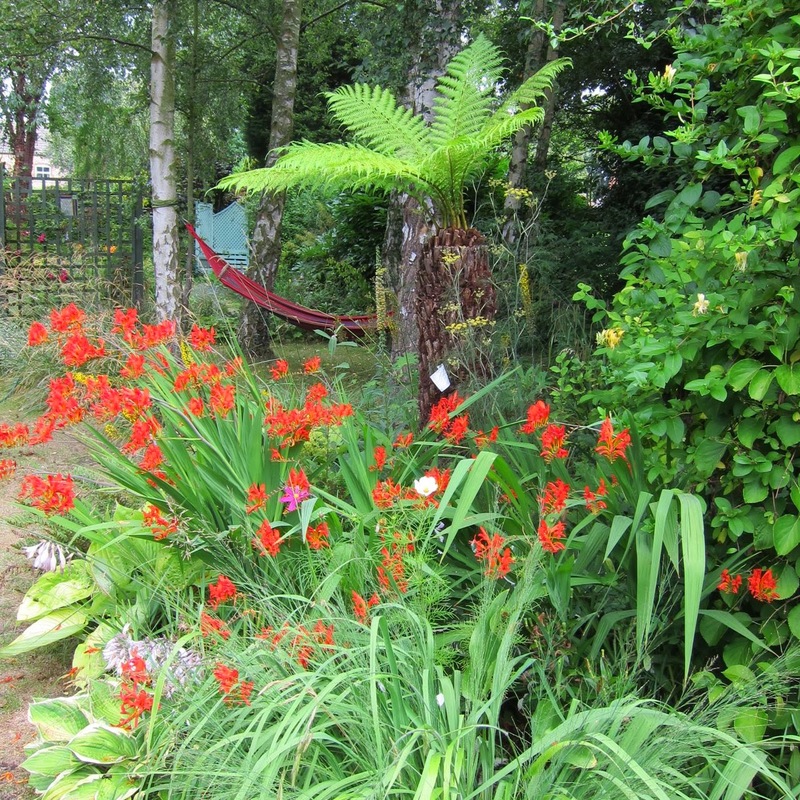 Keep up the blog - it is really good and certainly helps amateurs like me with garden ideas and experiences. Very pretty for a while though, isn't it? 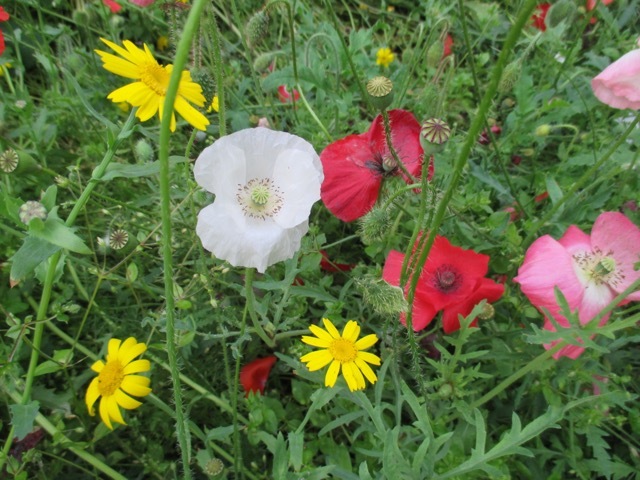 I tried sowing a mixed packet of seeds this year for a 'wildflower meadow' effect. Ha! - the Sunflowers, Zinnias, and Cosmos smothered out the smaller plants. And then there are weeds and grass in there, too. But, looking on the bright side, I have beautiful Sunflowers! It was very pretty for a nanosecond ! It's all about trial and error , and that mix sounds interesting! It looks lovely and it is a difficult decision to abandon the idea. But this sort of wildflower meadow is always work intensive and ultimately messy and disappointing. A fire pit will be much more fun. Chloris, you are so reassuring! 'Fire pit' sounds much more fun than 'work intensive, messy and disappointing'! Thanks for your insightful post, I have just decided to do some patches of meadow sowing for the first time so will see how i go. Hi Gardeninghands - I will follow your progress with interest! I have always wanted a little meadow area, but wondered, too, how I would keep the weeds out. Your meadow looked so lovely while in bloom. But I understand your decision; there's only so much energy one can give to the garden. 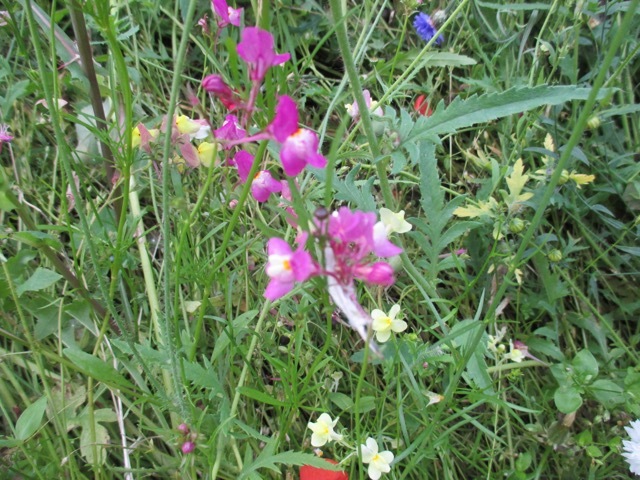 Maybe a small meadow in a container would work next year? Hi Rose, I must admit I have never considered using a container for a 'meadow' - it is an interesting thought! Such a gay profusion of flowers! Side order of Begonia with that, madam?